Yes, we started last year’s race report with the same subtitle and we have to repeat it. Difficult to imagine but it is truly a unique and pristine piece of nature: the crystal clear, mighty Lake Hovsgol, called “mother lake” by locals. The raw, rocky mountains. Chichee pass with its wonderful views of Lake Hovsgol and the panorama view all the way to the Siberian Mountains in the north. The mossy forests, the lakeside trails, the dry riverbeds, the seas of wildflowers, Edelweiss included and the aroma of herbs along the race course. The yak herds and the wild horses. A unique group of people gathered at this beautiful place in August 2014. The local nomads, the Mongolian cooks, musicians and dancers. The horsemen and local nomads overlooking the course and helping at aid stations. The runners, this time from 13 countries, local runners included, seem to be a special breed, all very communicative, ready to help, jolly, disciplined, etc., making the job of the organizers even easier and more enjoyable. Again Mongolia “legend” Marc Progin was there, a Swiss national who has travelled by bike through the most remote places of Mongolia and has taken part in MS2S for many times. Marc is a passionate photographer, organizes exhibitions, publishes photo books and put together an impressing slideshow for the MS2S runners (www.progin.com) on the third evening in the camp. He arrived much earlier and was training hard in the hills behind the lake (up to 2960 meters), getting ready for his speciality 100K. At 69 years young!? A few runners came for their first 42K, intending to remember it “for the rest of their lives”. And a few who originally registered for 42K upgraded on the spot for 100K. And a few of those made it to 100! It seems that this sort of feat is possible, for many different reasons, only here. There were all the helpers: Shuree, the good soul of the event, who was not only organizing everything in Toilogt camp, but worked long hours in preparation of the race and took great care of the participants in Ulaanbaatar, before and after the race. She had at her side in the camp the great assistance of Nemo, who had to refresh herself very quickly after a tough 12 days horse trek before the race. This time we had two race photographers, Khasar and Peter who have been everywhere and always, particularly on race day, taking stunning pictures. There was the race doctor Benjamin, Dr.Ben, taking great care of the runners’ needs, assisting locals and overall contributing to the high spirit in the camp. He was here for personal reasons, too: His partner Emma was here for her very first 42K. And of course Chalotte, very dedicated as the time-keeper, helper at the finish line, webmaster and co-organizer. It’s all these people who help making the MS2S what it is – the world’s most beautiful 42k and 100k trail run. Let us be modest: one of most beautiful! Thank you so much everybody in the name of the organizers and all participants. A few people arrived at the camp one full week before the race week, for better acclimatization and additional training. This worked so well that we are going to promote it for 2015, with guided training, hiking and relaxation. Stay tuned! The rest of the participants came on Saturday from Ulaanbaatar on the late flight to Murun, then from Murun to Toilogt by car for late dinner of….,of course, pasta, carbo-loading for the race. Once the group settled in gers or tippies in Toilogt camp at the lakeshore, the outside world seemed to stop turning. No internet, no news, no job, no stress. O yes, mobile phones are now reliably operational and we already miss the time when this was not the case. The only stress was now to get your mobile phone charged in the evening when the generator for electricity was in operation. Otherwise, only nature and other buddies runners! On the first evening in camp, after dinner we had a cultural performance of a group of young musicians and dancers, in their traditional costumes playing/dancing typical tunes of Mongolia. A good way to start familiarizing with the country and its people! Compared to the previous year, there is a new shower/bathrooms facility in the camp and the availability of hot water was excellent. And: No more old sauna, but new one has been promised for 2015! For better acclimatizing to the altitude of 1’600 meters, the participants went out during the first few days for horseback riding, kayaking on the lake, hiking, mountain biking or checking/running along the race course. And we had our obligatory medical check-up spread across these two days. In anticipation of the race, a positive tension started to develop, with people exchanging experiences from previous races, advising each other, collecting stuff for “a poor runner” whose luggage did not make it to Mongolia, etc. And we had a nice session of “yoga for runners”. Thank you Julia, and we hope for more in the future! Wake up call was at 3:00a.m. with tunes of a traditional Mongolian horn. The atmosphere is fascinating and like a charge is in the air. Runners gather for a light breakfast and final control of everything needed in the backpack – compass, map, safety package, flashlight, rain gear. At 3:55am, the runners gather outside at the START sign. It’s cold and dark, many flashlights, last pictures taken, jumping and stretching to warm up the muscles…countdown and GO! The race starts and the runners disappear into the first 3k dark forest for a long day, for one very special push of their life. Runners need to be especially cautious on these first 3k in the forest: trunks, trees, roots – it’s dark and slippery. But everyone is prepared and briefed well and makes it out of the forest without serious problems. A lakeside horse trail for the next 10k: The sun doesn’t rise yet, but the night slowly fades into the morning. It is magical. Some of the fast runners already pace up Chichee pass, while others only approach the first aid station at kilometre 12, welcomed by cheers and excellent service. It is steep up the mountain on what used to be many years ago a narrow road built by Russians, but if you manage to lift your head, it is beautiful. The view on the Lake Hovsgol and our camp in the distance is spectacular. The sun rises and makes the scenery on Chichee pass unforgettable. The first downhill is a surprise. Steep, with loose rocks in the wet and high grass – it is important to take good care not putting too much weight on knees and ankles and not going too fast. Then follows one of the most beautiful parts of the race – simply stunning: Through marshy forests, riverbeds, past the 26k aid station, up a fairytale-like valley and up on Khirvesteg pass. “It is one of the most gorgeous parts of the race. But still, this is where some of you might curse me”, is what race director Nicolas had said the day before the race. And really, it is a mix. A mix between “Wow, it’s beautiful” and “Damn, that’s steep”. Because there is no path; just green markings on the trees and you have to find your way, looking for a next mark. All this on a carpet of thick moss and very, very steep. Up on the pass is a Mongolian Ovoo and again beautiful view on the lake and mountains around. Runners, according to local Shamanistic tradition, circle it three times clockwise to ensure good luck. And they need it! After another demanding downhill, runners move back to the lakeside and finish the last 10k of the 42km marathon distance along beautiful horse trails. They pass yurts, herds of yaks and horses and run along the lake all the way back to the camp. Why run fast when every minute is just remarkable. Not for Alex who finishes the marathon first in a new record time of 3:48 hours. Living in the area of Hatgal, Alex was familiar with the course, but it seems that he had a lot of power left, because he jogged home for the next 10k. What a performance!? 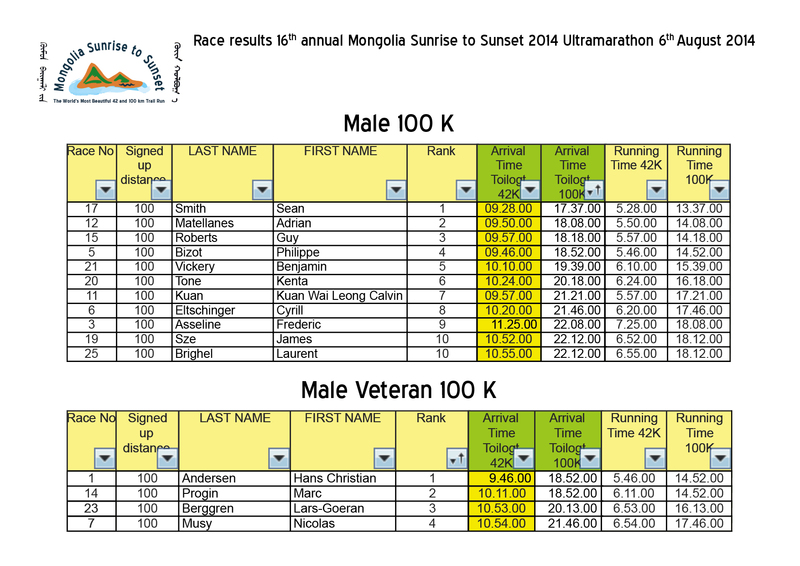 And the local Mongolian runner Batnyam came in second in 4:08 hours. Third was Anthony from New Zealand with 4:55. Another local runner Enkhtur won the veteran 42k category in 5:38, followed by organizer Steen from Denmark (6:46) and Imai-san from Japan (7:54). 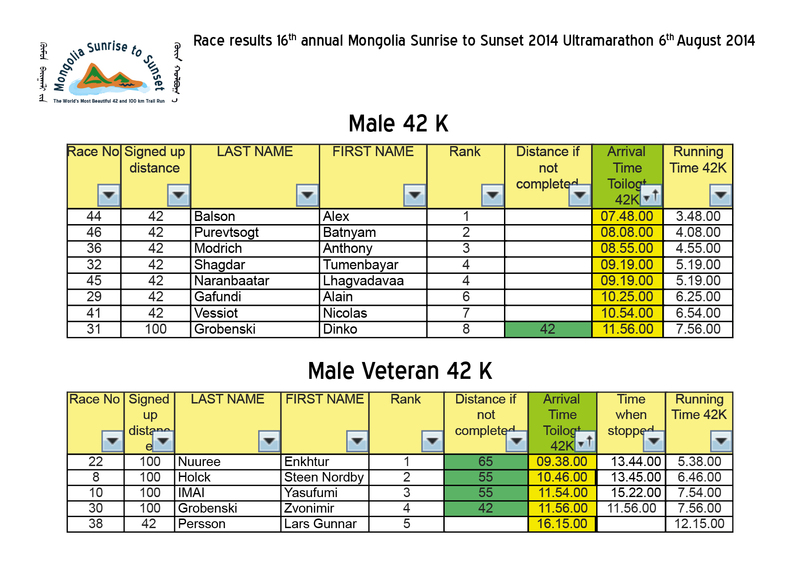 All three veterans actually ran more kilometers, with Enkhtur stopping at 65k, and the other two at 55k, qualifying for “42k only” but knowing in their hearts that they ran a lot farther. Steen, after stopping at 55k, took a horse for a 12k ride along the lake back to the camp. Where else in the world could you do something like this? Well done Steen! 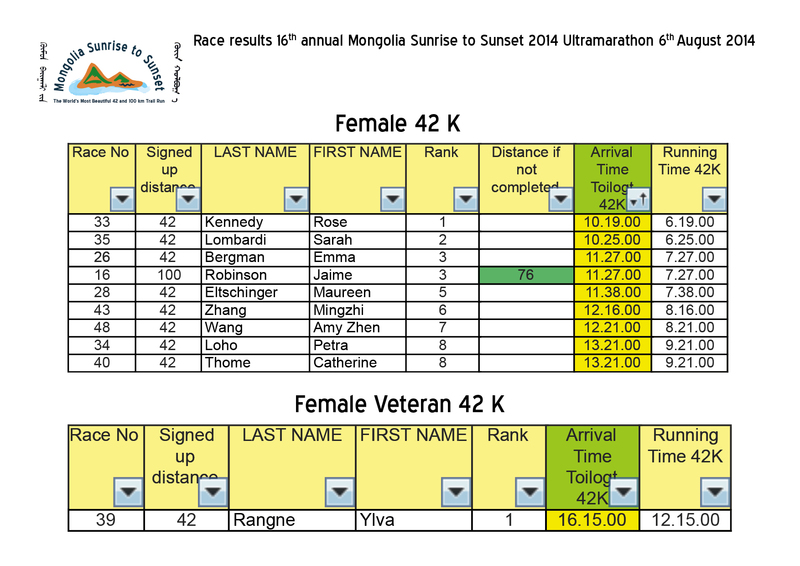 The fastest lady in the 42km race was Rose with 6:19, an American runner working for Peace Corps in Gobi, teaching English in a local school, supported by her mum Debra, waiting at the finishing line, cheering and working as a volunteer there. Second came Sarah with a great time of 6:25 in this very tough mountain marathon with over 2000 meters elevation gain and loss. Congrats! Swedish Emma, in her first ever marathon, ranked third female with a time of 7:27 hours. In the veteran category Ylva won with 12:15, but it has to be pointed out that she and Lars got lost, went to the top of Chichee, rambled around and only then returned to the right track. Influenced by the magic of the mountain they went to the 2400 meters top. “Beautiful view!”, they said later. We have been extremely lucky with the weather having a sun in the first half of the day and yet not that hot. But this was for 42k. To continue, or not? 58k more to go! While some of the runners enjoyed their well deserved beer or cooled their sore feet in Hovsgol Lake, for ultra runners the 42k mark was “just another aid station”. They had 58k to go, along the lake, on a new trail away from the lake and in the forests, into the valleys, up on Jankhai pass on a new horse trail staying left of the road all the way to 76k. This year again at the top of Jankai pass our trail was going through the meadow full of Edelweiss. Hundreds and hundreds of them, and we believe that our photographers documented this very well. Modot Bulan aid station, being again the turning point in the south with a cut-off time of 14 hours. A beautiful but tough course of 12k along the lake lead runners back to the north, through the forest and with lots of mud, which was very slippery. And after reaching Jankhai aid station again, now at 88k, the last stretch along the lake to the camp followed. In the afternoon a few runners have been caught by rain, even hail, but luckily neither lasted very long. In total 100 extremely tough kilometres with an accumulated elevation gain/loss of 3,365 meters! And multiple measurements with Garmin watches provided values 99.6 to 99.8k; pretty close to what many believe is more than 100k. This was a completely new and a once-in-a-lifetime experience for many and some committed on the spot to be next year again with us. Sean, a passionate and very fast marathon runner, started strong and his early lead of 30 minutes in front of followers stayed until the end, winning 100k with time of 13:37 hours. When he crossed the finish line, cheered on by many fellow runners, he seemed to still have a lot of energy. Second was Adrian from Spain with a great time of 14:08, especially considering that he only decided to go for the 100k distance a week before the race, during the horse trek. Hasta la vittoria Adrian! “A poor runner” who did not get his luggage, running in borrowed stuff, was Guy from Australia, and he finished third with 14:18, honoured particularly with his wife Anja who was waiting and helping at the finishing line. Try to imagine how fast he would be with his own equipment? Experience and fighting spirit counts. When Marc, old fox from Switzerland, learned at 88k aid station that the difference to Hans and Philippe was “only 20 minutes”, he was running all the way to the finish line, catching up in a dramatic sprint and entering the finish line together with Hans. As a result, they share the first place 100k veterans with remarkable 14:52. See you next year, Marc! You promised to run again 100k at 70 years old! What a spirit! Third was Lars-Goeran with 16:13, adding this race to his collection of over 200 marathons and ultras all around the world. Nicolas, the organizer was fourth and he has to be mentioned as the only one running all 16 races. Keep going Nicolas, we are proud of you! Rhonda was the fastest female 100k runner with an impressive time of 14:25, especially considering that she lives and trains in downtown Cairo. Does anybody know a trail, or hill there? Only pyramids? Second was Kylie with a time of 14:30,”her first and last 100” (but we do not believe her! ), followed by Nicole in 15:54 hours. We are free here to quote Kylie: “It’s hard not to enjoy a run in such a stunning place.” The only runner that managed to finish in the ladies’ 100k veteran category was Isabelle from France – having experience from many other ultras, like Guadalupe, Sahara, Barceló, etc., and running for a good cause, she finished this ultra distance in 18:12! Bravo Isabelle!! We received many compliments about helpers at aid stations, all Mongolians, nomads, in their traditional robes, horsemen included. A few quotes from participants include “aid stations were fabulous”, “those local helpers really made my day”, “such care and joy”, ”made me laugh and smile every time”, “so helpful”, “I got a flower”, etc. Yes, these are the nomads of Mongolia. They recognize what we/you are doing for them and even without it, with their kindness and hospitality, they act as they do. A picture says more than 1000 words. We will provide selected race photos from Peter and Khasar on the internet and provide possibility for sharing photos and videos of all interested participants on a similar way. Please check www.MS2S.org and our Facebook page (www.facebook.com/MongoliaSunriseToSunset) in the coming days and weeks. Please share your photos and videos. Thank you again Peter and Khasar for your very hard work. 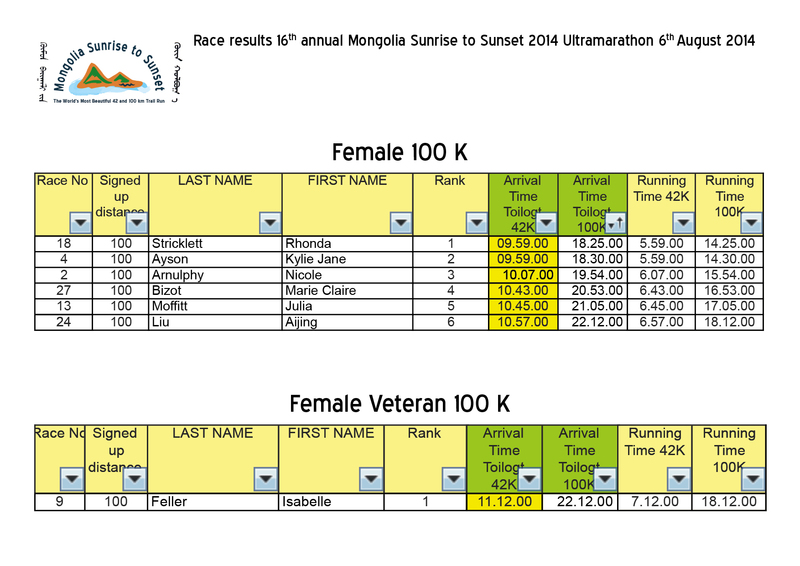 The 17th Mongolia Sunrise to Sunset will take place on August 5th 2015! Please, come back (a few already promised!) and help us to spread the word. It was great having you in Mongolia, racing on mountains and along the “mother lake”, and herewith helping to provide funds for activities of our ecoLeap Foundation www.ecoleap.org , protecting the environment and keeping this national park so clean and nice for future races and for all visitors to come.